The second quarter of 2014 saw modest positive gains for Canadian ETF portfolios after a first quarter that saw strong gains from unexpected sources. After a 3.9% depreciation of the Canadian dollar relative to the USD in 1Q that provided a strong tailwind and proved quite profitable for Canadian ETF investors, the currency reversed course and appreciated 3.4% in 2Q. The strength of CAD produced losses in a number of foreign currency denominated ETFs. US and global growth were far weaker than expected in 1Q14 with the US economy contracting at a surprising 2.9% annual rate and the global economy expanding at 1.4%, the weakest quarter since the GFC. In contrast, US employment gains and purchasing managers' indexes were consistent with solid growth. Emerging Markets showed mixed performance with growth in Russia and Brazil slowing markedly, but growth in India accelerating. US and global inflation, which was worrisomely low early in the year, turned higher as food and energy prices rose and core inflation edged up. 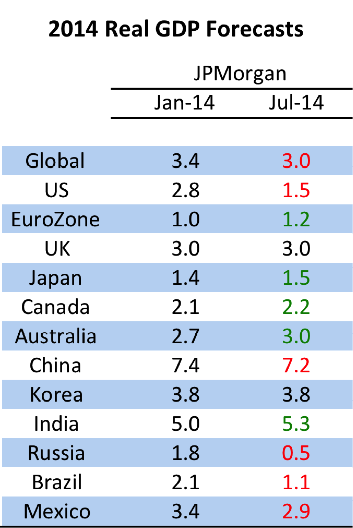 US and global growth forecasts for 2014 were marked down down sharply in 2Q. As we explained in December, optimistic economic forecasts made at the beginning of each year recently have been met with disappointment. This year is no different as the weak growth in 1Q now has economists forecasting lower growth this year than in in 2013, which itself was a disappointment. Disappointing growth in the US and Japan and uncomfortably low inflation in the Eurozone have kept central bank policy and forward guidance accommodative. The US Fed has continued to taper its QE program but, despite strong employment gains and a faster than expected decline in the unemployment rate, Fed Chair Janet Yellen appears in no hurry to raise the policy rate. ECB President Draghi also took additional steps to ease monetary policy and the Bank of Japan remains committed to large scale QE to hit the 2% inflation target. The Bank of Canada continued to signal in 2Q that it is in no hurry to raise its policy rate. However, a larger than expected rise in CPI inflation to 2.3% in May raised market expectations that the BoC might tighten ahead of the Fed and contributed to CAD strength late in the quarter. In 2Q, with the Canadian dollar appreciating 3.4% against the US dollar, the best global ETF returns for Canadian investors were in Canadian equities and bonds. The worst returns were in Eurozone equities, US small cap equities and US high-yield bonds. In global equities, the Canadian equity ETF (XIU) performed best, returning 6.0% in 2Q and 12.0% year-to-date. The S&P500 ETF (SPY) returned 1.1% in CAD terms in 2Q and 6.3% ytd, while the Japan equity EFT (EWJ) returned 2.6% in 2Q and -0.5% ytd, and the Eurozone equity ETF (FEZ) returned -2.0% and 3.1% ytd. Emerging Market equities (EEM) returned 1.8% in CAD terms in 2Q and 3.8% ytd. US small caps (IWM) returned -1.4% in 2Q and 3.3% ytd, significantly underperforming large caps (SPY). 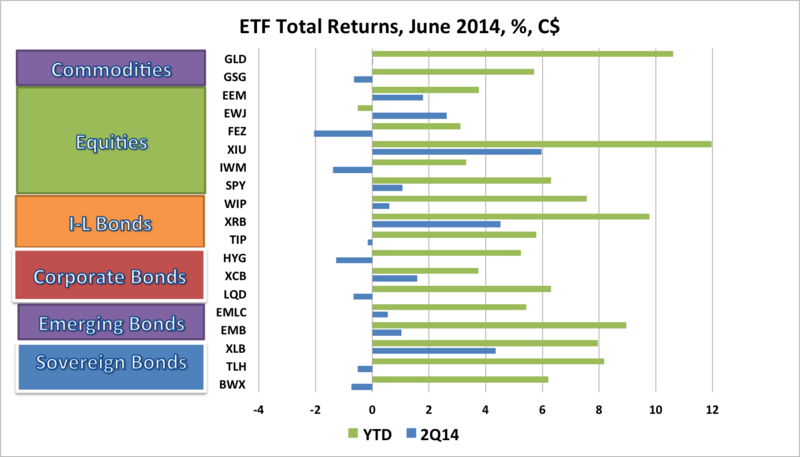 Commodity ETFs turned in weak performance in 2Q, hurt by the strength of the C$. The Gold ETF (GLD) returned just 0.03% in CAD terms in 2Q, but was still up an impressive 10.6% ytd. The iShares GSCI commodity ETF (GSG) returned -0.6% in 2Q, but gained 5.7% ytd. Global Bond ETFs also turned in mixed performances in 2Q. Foreign bond ETFs were hurt by currency weakness relative to the Canadian dollar but long duration bonds benefited from a combination of weaker than expected economic growth and safe haven demand. The Canada Long Bond ETF (XLB) posted a gain of 4.3% in 2Q and 7.9% ytd. The US long bond ETF (TLH) returned 3.0% in USD terms, but with the strengthening of the C$, this translated into a -0.5% return in CAD terms. Despite the 2Q loss, TLH was up 8.2% ytd based on strong 1Q performance. Non-US global government bonds (BWX) fared no better, posting a return of -0.7% in CAD terms in 2Q, but hanging on to a 6.2% return ytd. USD-denominated Emerging Market bonds (EMB) returned 1.0% in CAD terms in 2Q and 9.0% ytd, while EM local currency bonds (EMLC) returned 0.5% in 2Q and 5.4% ytd. Inflation-linked bond (ILB) returns also varied according to their currency denomination. The Canadian real return bond ETF (XRB), benefiting from its long duration, returned 4.5% in 2Q and 9.8% ytd. US TIPs (TIP) fared worst returning -0.2% in CAD terms in 2Q and 5.8% ytd, while Non-US ILBs (WIP) fared a little better, returning +0.6% in 2Q and 7.6% ytd. Among corporate bonds, the Canadian corporate bond ETF (XCB) performed best returning 1.6% in 2Q and 3.7% ytd. The US investment grade bond ETF (LQD) returned -0.7% in CAD terms in 2Q but held on to a gain of 6.3% ytd. The US high yield bond ETF (HYG) posted a return of -1.3% in 2Q and 5.3% ytd as high yield spreads widened. 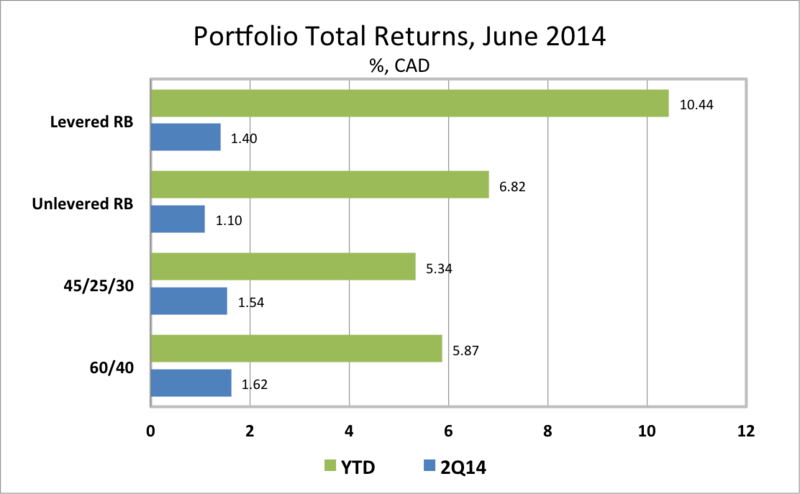 In 2Q14, the Canadian ETF portfolios tracked in this blog posted modest positive returns, following strong performances in 1Q. The traditional Canadian 60% Equity/40% Bond ETF Portfolio gained 1.62% in 2Q basis points to be up 5.87% ytd. A less volatile portfolio for cautious investors, comprised of 45% global equities, 25% government and corporate bonds and 30% cash, gained 1.54% in 2Q to be up 5.34% ytd. Risk balanced portfolios underperformed in 2Q. A Levered Global Risk Balanced (RB) Portfolio, which uses leverage to balance the expected risk contribution from the Global Market ETFs, gained 1.40% in 2Q, but had a stellar gain of 10.44% ytd. An Unlevered Global Risk Balanced (RB) Portfolio, which has less exposure to government bonds, ILBs and commodities but more exposure to corporate credit, returned 1.10% in 2Q to be up 6.8% ytd. Asset price gains slowed in 2Q and the Canadian dollar reversed most of its 1Q weakness. Year-to-date portfolio returns remained solid but momentum slowed markedly in 2Q. For the year-to-date, the strongest ETF returns in the portfolios tracked in this blog have come from Canadian equities, gold, Canadian inflation linked bonds, emerging market bonds and Canadian and US long bonds. Both gold and long bonds have far outperformed strategists expectations. This has come amid weak economic growth, geopolitical stress and low inflation. In 2Q, however, there were clear signs that some asset valuations had become stretched. US small cap equities, Eurozone equities, and US high yield debt all posted subdued gains in in USD terms and outright losses in CAD terms. Most strategists now expect the surprises of the first half of 2014 to unwind. The consensus view is that US growth will rebound to a 3% or stronger pace, lifting global growth. Inflation is expected to creep higher. Yet the Fed, ECB and BoJ are expected to remain patient, delaying any tightening until mid-2015 or later. Just as the strongly held growth optimism at the beginning of 2014 went off the rails, the current consensus view seems likely to prove wrong. It is likely to prove wrong because it is internally inconsistent. If growth rallies strongly and inflation moves higher, it is unlikely that central banks will remain as accommodative as markets expect. On the other hand, if growth continues to undershoot expectations enabling central banks to remain easy, both equity and high yield debt valuations are likely to remain under pressure. In this uncertain environment, remaining well diversified with an ample cash position seems like the prudent strategy. High-yield debt positions should be trimmed. Long duration bond positions are at risk if the consensus view plays out. Equities and commodities would be at risk if growth fails to reaccelerate. As it turned out, a number of major equity and bond markets lost momentum in June and Canadian portfolios with substantial cash positions outperformed portfolios with heavy exposures to global equities and bonds. Having ample cash in the portfolio remains a good strategy until the unstable disequilibrium of weak growth, low inflation, accommodative central banks and stretched asset valuations is resolved. What would your portfolio suggestion be if the "unstable disequilibrium of weak growth, low inflation, accommodative central banks and stretched asset valuations" is the baseline scenario going forward in the Canadian context? And by going forward, I mean stagnation and the inability of the monetary policy channel to spur a return to trend rate of growth. This is an unpopular position but so was the belief that nominal rates would skirt the zero lower bound for 6 years, or 18 years if we consider Japan. Thanks for the comment! My portfolio suggestion would be to sell risk assets. Equity markets are already pricing in a return not just to what is believed to be trend growth, but to stronger than trend growth. My concern, like yours, is that trend growth has shifted down to an extent that the consensus is unwilling to grasp. However, each time growth has disappointed, central banks have responded with additional ease, hoping to restore growth to its previous trend. In the process, they stretch asset valuations even further. It has been profitable to stay with risk assets as long this process has continued. One day that will not be the case, but I have little confidence in our ability to forecast when that date will arrive.